Behold! 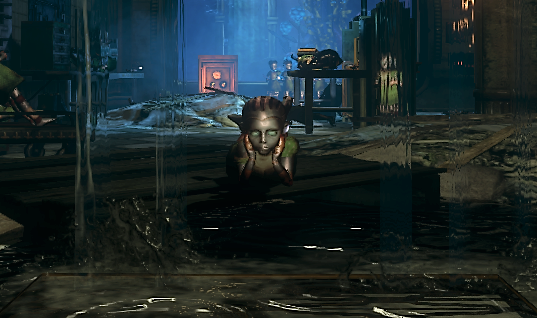 One of the creepiest moments in Bioshock 2 (in my opinion, creepy is subjective et cetera bla bla). During this part of my revisit to Rapture I was pretty on edge. Walking into this room really creeped me out. I was stressed, and creeped out by something before this encounter, so this brilliant detail scared the crap out of me. I powered through the room, saved the game and had to take a prolonged break to unjitter my nerves. Mechanical Little Sisters. To my knowledge, these didn’t have any screen time outside this room. These abominations are a stroke of genius. I’m not fully able to articulate what was so incredibly well done with this whole thing. The timing, detail, its played down significance in the story, the whole shabang just fit so well. Over 9000 kudos to the writers, designers and other creatives of this brilliant, mindfuck of a game. So sleep well knowing these won’t haunt your dreams (actually, they may do, as dreams are a cocktail of impressions throughout the day. Sorry).